This is one of the most exotic plants you can easily grow yourself. Its glossy leaves end in tendrils, which supports the plant as it climbs and scrambles over a fence or along a trellis. 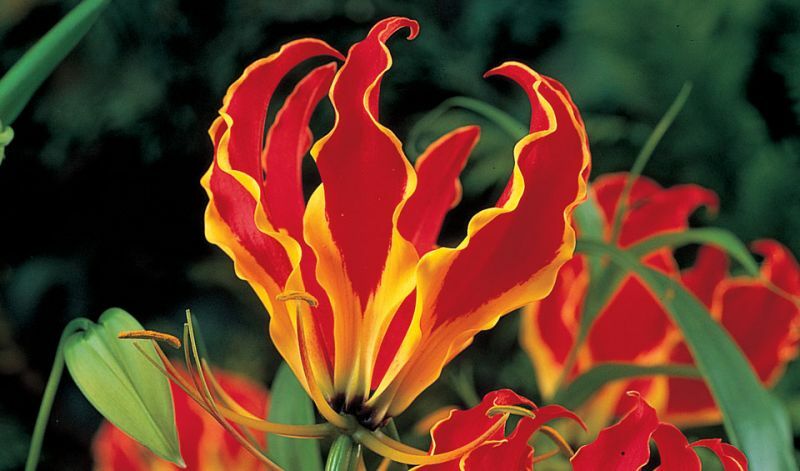 Flowers are produced from the leaf axils at the top of the plant, striking 3-5" / 7-13 cm flowers resembling a Turk's-cap lily. The undulating petals are strongly reflexed with protruding stamens. They are excellent high fashion cutflowers for bouquets and corsages. Cut them when they have almost opened all the way and split the end of the main stem before putting them into a vase. Anywhere near a trellis, obelisk, pergola, old tree stump or a fence. 'Greenii' (pale yellow-green), 'Lutea' (yellow) and 'Rothschildiana' (red, yellow edge).